I am glad this post is in the universe. It always makes me glad to see someone represent, who not only is openly gay, but clever. This may frighten some folk – I think we both know with whom I am referring. Most importantly I think it is just great exposure for the gay community and knocks down more walls. I have read somewhere that “Pat” has alot of respect for Ms Maddow. Who would have thought that he could ever have social discourse with a out lesbian and respect her at the same time! I was bereft at Rachel’s absence from her TV show this week. Yay! She’s back. Just once, maybe for New Year’s Eve, I’d like that cute butch dyke to do her show in a t-shirt, jeans and sneakers. 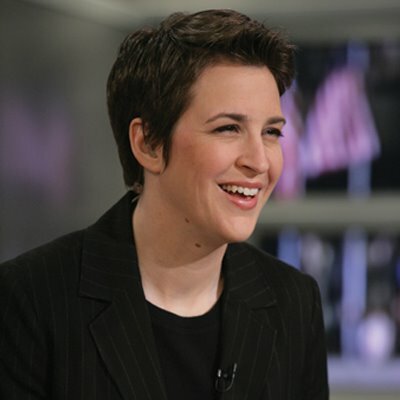 Please, MSNBC, for all her lesbian fans. I’m also glad that Rachel is back from her day off. That would be fab if they would allow a dress down day. Maybe’casual fridays’?